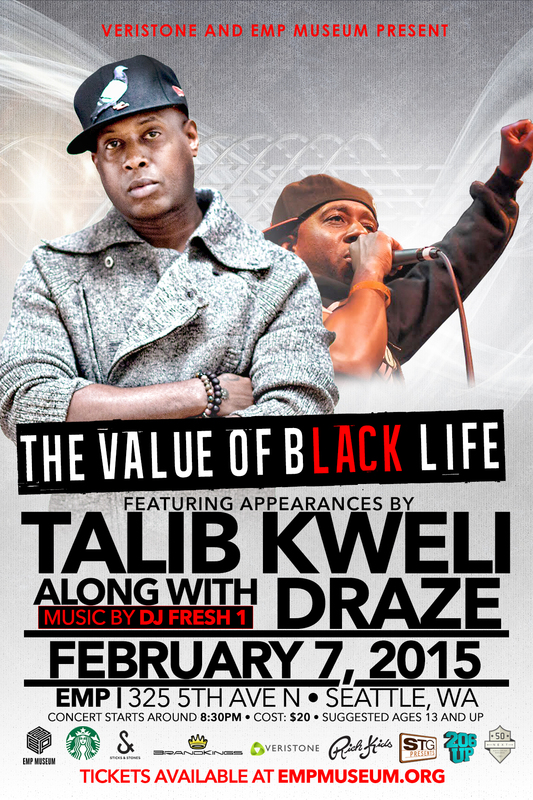 206UP is a proud marketing sponsor of the EMP Museum’s Black History Month kickoff event: Through the Eyes of Art featuring The Value of Black Life artist showcase with appearances by Talib Kweli and Seattle hip-hop artist Draze. It’s going down on Saturday, February 7, 2015 and tickets can be purchased here. More details below via the EMP website. The Brandkings and EMP Museum present Through the Eyes of Art, the kickoff event for EMP’s Black History Month celebration. This year, Seattle’s premier Black History Month celebration brings together work from regional artists and photographers in The Value of Black Life art showcase. The second annual Through the Eyes of Art will feature a keynote address from the former National Director of Youth Engagement at World Vision Derrick Wheeler-Smith, remarks from City of Seattle Mayor Ed Murray and Seattle City Council Member Bruce Harrell, and a live performance by hip-hop heavyweights Talib Kweli and Draze. 206UP would like to extend a special thanks to Draze and The Brand Kings for bringing us on board!